The Eatery (3431 W Broadway, Vancouver, phone: 604-738-5298) is a funky Japanese restaurant that has a candle-lit night-club atmosphere and is a popular hangout for UBC students. The primary attraction here is the inventive fusion sushi rolls, with off-the-wall names such as “Andy Warhol Roll”, the “Erotica Roll”, and the “Viva Las Vegas Roll”. The specialty rolls are in the $5 to $8.50 range for a roll, and there are different specials depending on the day of the week. 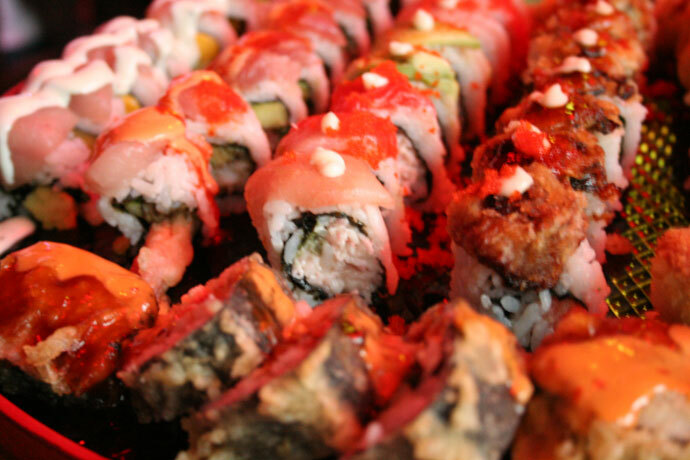 Pictured below is the “Assembly Line” sushi platter which has a large selection of specialty rolls ($47.50) – this enough food for four people with average appetites, or will surely satisfy two people who are very hungry. 16,716 views. This entry was posted on Tuesday, September 11th, 2007 at 10:15 pm	and is filed under Asian, Broadway, Casual, Creative Dishes, Food Photos, Fun atmosphere, Fusion, Japanese, Kitsilano, Lively, People Watching, Restaurant, Sashimi, Seafood, Students, Sushi, Take Out, Trendy, UBC, Vancouver, Vancouver Restaurants, West Broadway. You can follow any responses to this entry through the RSS 2.0 feed. You can leave a response, or trackback from your own site. That looks wild! Heard many good things about this place. Will have to check it out.